Resin’s Java EE certified architecture is cloud-enabling. You can choose to have Resin power your SaaS application or utilize it as the backbone of your PaaS/IaaS platform. Resin’s lightweight and modular base allows you to position your application in a public, private or hybrid cloud. Use Resin’s easy setup and configuration to enable new web apps quickly. Speed up your application upgrades by facilitating our integrated framework and management solutions in the cloud. Complete all your processes to numerous machines while your deployment remains live. Increase your up-time with a smart software load balancer that understands your toplogy. Optimize resources, maximize throughput, minimize response time and avoid overloading your resources. Make your servers session aware, efficient and persistent. The entire Resin product line’s incredible growth is driven by fast performance, built-in server monitoring capabilities and extreme reliability. Resin’s unsurpassed reliability is a testament of its Health System and Watchdog process. Resin’s Health System provides server monitoring and JVM monitoring and full server recoverability (self healing). As traffic increases beyond a single server, Resin’s load-balancing lets you add new machines to handle the load and simultaneously improves uptime and reliability by failing over requests from a downed or maintenance server to a backup transparently. <resin:LoadBalance> is part of Resin’s rewrite capabilities, Resin’s equivalent of the Apache mod_rewrite module, providing powerful and detailed URL matching and decoding. More sophisticated sites might load-balance based on the virtual host or URL using multiple tags. Once your traffic increases beyond the capacity of a single application server, your site needs to add a HTTP load balancer as well as the second application server. Your system is now a two tier system: an app-tier with your program and a web-tier for HTTP load-balancing and HTTP proxy caching. Since the load-balancing web-tier is focusing on HTTP and proxy caching, you can usually handle many app-tier servers with a single web-tier load balancer. Although the largest sites will pay for an expensive hardware load balancer, medium and small sites can use Resin’s built-in load-balancer as a cost-effective and efficient way to scale a moderate number of servers, while gaining the performance advantage of Resin’s HTTP proxy caching. Server caching can speed dynamic pages to near-static speeds. When pages created by database queries only change every 15 minutes, e.g. CNN or Wikipedia or Slashdot, Resin can cache the results and serve them like static pages. Because Resin’s caching only depends on HTTP headers, it will work for any JSPs, servlet or PHP page.response. Resin’s caching operates like a proxy cache, looking at HTTP headers to compare hash codes or digests or simply caching for a static amount of time. Since the proxy cache follows the HTTP standards, applications like Mediawiki will automatically see dramatic performance improvement with no extra work. You can even cache REST-style GET requests. Because the cache supports advanced headers like “Vary”, it can cache different versions of the page depending on the browser’s capabilities. Gzip-enabled browsers will get the cached compressed page while more primitive browsers will see the plan page. With “Vary: Cookie”, you can return a cached page for anonymous users, and still return a custom page for logged-in users. Behind the scenes, Resin is powered by its own full web server developed 100% in-house at Caucho. Because we have full control and can optimize each individual component, Resin Web Server is able to serve static pages faster than nginx™! Highly interactive web applications for tablets and phones will dominate the web in the next generation. Caucho’s relentless quest for performance and reliability paved the way for Resin Java Application Server to be a leading open source web and application server. Our Java EE Web Profile implementation includes Servlet, JSP, JSTL, EJB Lite, CDI, JSF, JMS and others. Resin provides an ideal environment for lightweight web development – where you can deploy a fast and highly responsive site. 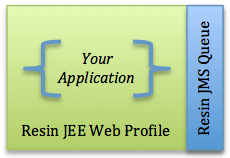 Resin 4 was the first Java EE Web Profile certified Java application server. Resin 4 was built from the ground up around Java Dependency Injection (CDI). Resin is over 13 years old, yet it has kept up with the times. Resin 4 has been optimized to work in cloud computing environments like Amazon EC2. Self-documented service declaration and binding. Java caching can speed application performance and lower database load by annotating cacheable methods. Resin application server that supports both CDI and JCache, you can add caching easily without much configuration. It uses the method parameters as a cache key, and stores the method result in the cache. On the next method call, the enhanced method will look for the saved result in the cache, and return it, saving the effort of the method. in-memory speeds to applications.” – Scott Ferguson, Software Architect at Caucho Technology. Because your site’s reliability is important, Resin monitors its internal sensor net every 60 seconds, recording your server’s memory, cpu, network, database and cluster status. 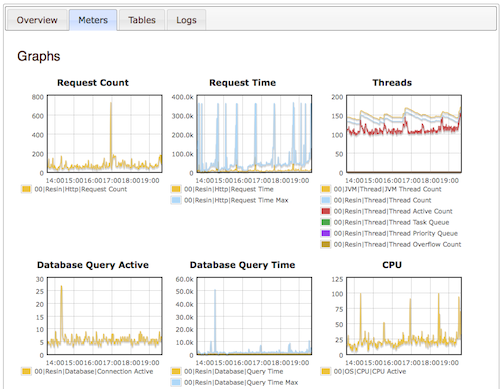 Resin monitors JVM metrics, Java Application Servers metrics and OS metrics. The Resin JAMM saves the data so you can adjust the servers based on load, and can analyze problems after they occur. The data is saved so Resin can identify trends and anomalies. Each 15 minutes, the health system checks the sensor data and reports a status: OK, WARNING, CRITICAL or FAIL. You can direct Resin’s health system to act based on the health check results, mailing a notification, gathering further thread and memory information or even restarting. health checks: validates system health every minute, recording for further action or review. rule-based health actions: when load is high or memory low, Resin can send mail, dump the heap, dump the threads, perform Java profiling or even restart based on administration rules. flexible monitoring: gathers, archives and displays any JMX value. postmortem analysis: when a server fails, the saved monitors and logs are available to determine and resolve issues. track trends and anomalies: track trends and anomalies with ability to do just in time Java profiling.